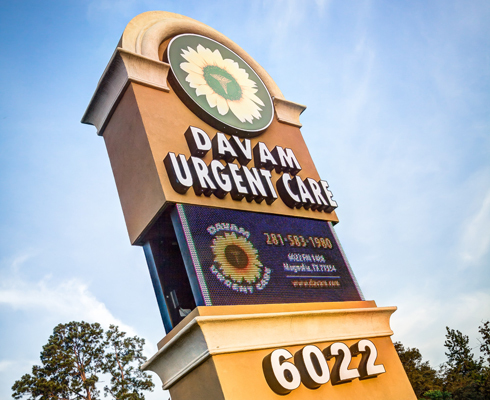 Davam Urgent Care is an after hours clinic located near the area of Tomball, TX. Our urgent care clinic serves patients of all ages in Tomball and the surrounding communities. We are open 7 days a week, 8am-9pm to provide care for non-life threatening injuries at a time that is convenient for you and your loved ones. Visiting our clinic will allow you access to medical care when you are unable to get a visit with your primary care physician, or are not wanting to visit a costly freestanding or hospital emergency room. Patients who visit our after hours clinic located near Tomball will receive the best care possible from an experienced medical provider. Our clinic can treat many conditions including sinus infection, allergies, flu, strep throat, cough, back pain, fever, dehydration, bronchitis, minor lacerations, sports injuries, and more. Extended hours. Our clinic is open 8am-9pm, 7 days a week. We are also open most holidays to better serve you. We accept most insurance plans. Davam Urgent Care is in network with most commercial insurance companies including BCBS, Aetna, Cigna, Humana, United Healthcare, and more. Wide scope of services. In addition to urgent care, we also offer x-ray, labs, urine screening, EKG, on-site lab, and other diagnostic services. Care from a board certified medical provider. At Davam, you will always be seen by an experienced medical provider. For more information about Davam Urgent Care located at 6022 FM 1488 in Magnolia TX, please contact us at (281) 583-1980. Davam Urgent Care services the following zip codes in Tomball, TX. 77375, 77354,77362,and 77377. We also treat patients in the Tomball neighborhoods of Timberwilde, Northwoods Estates,Stonebridge Ranch Estates, Spring Creek,Holly Creek Estates, and more.